After 3 agonizing years of teasers, No Man’s Sky is finally available for both the PS4 and PC. 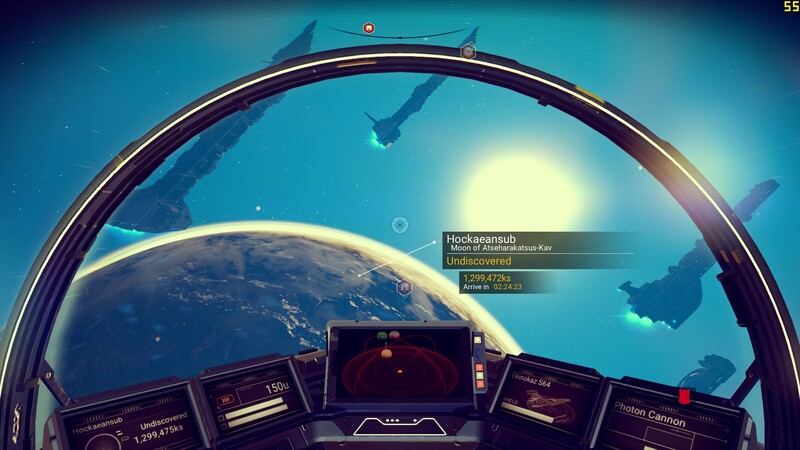 First shown at the VGX awards in 2013, developer Hello Games promised to literally give players the universe. One of the core gameplay elements and selling points of the game is its procedurally-generated universe with unique planets and solar systems, offering players the largest open-world experience to date. Players begin their journey through the cosmos as “The Traveler”, a faceless individual who crashed on the surface of an alien planet. Having examined his/her destroyed ship, The Traveler sets out to harvest resources to repair his/her ship, and replenish the shielding and health capabilities of the protective Exosuit spacesuit. Players who thoroughly examine their crash sites before ascending into space are given the most crucial decision of the game- follow the path of the Atlas, or continue on a self-directed expedition through the universe. By examining the red floating orb outside The Traveler’s wrecked ship, players can either agree or disagree to follow the path of the Atlas, which sparks a pseudo-guided journey towards the center of the universe. The “Atlas Path” will guide players between planets and solar systems with the intent of discovering new items ancient artifacts and relics, leading to the previously mentioned center of the universe. The Traveler will learn of the Atlas and the ancient species of the universe through “Monoliths”, “Ruins” and “Knowledge Stones”. Knowledge Stones only possess words from alien languages, though Ruins and Monoliths grant The Traveler with insight into their beliefs and customs; Monoliths challenge The Traveler through word-based logic puzzles and situations, however each puzzle lessens in difficulty as the player discovers more alien words. Alternatively, players may come across structures housing Data Terminals, many of which are infested hives full of organic overgrowth. Each terminal includes a Data Log containing the final thoughts of the previous user, complimented by a new map Waypoint or an item-crafting recipe. Apart from the relics, players are left with very little plot and no strong motivation to dedicate themselves to the Atlas Path. The most intriguing aspect of the loosely guided tour is the final destination- the center of the universe. Here lie the revelations of No Man’s Sky, however players seeking a definitive conclusion may be severely disappointed by the lack of closure at the end of their journey. Players are given absolute freedom from the moment their ships are ready to launch, however there’s a surprising lack of meaningful content to be found among the stars. It shouldn’t have to be stated, but the space sim from Hello Games is not a multiplayer space combat simulator, so much as a research expedition fueled by the player’s own willingness to document extraterrestrial life. The Traveler is equipped with a Scanner allowing him or her to document the environmental features of every planet, including plants, some rock formations and a strange assortments of wildlife. For every new creature, plant and mineral documented, the player will receive currency- or “Units”- and have the option of uploading and renaming his or her discovery to the game’s servers; in the off chance that another player sees a previously-discovered lifeform, a box will appear, showing the name of the player who discovered said lifeform, along with its new name and statistics. While it seems to have no lasting effects, players can attempt to befriend wild animals by feeding them Carbon-based resources. Interplanetary research can also lead players to discover new items that can be harvested on each planet. Through the multipurpose Mining Tool, The Traveler can extract useful elements from plants, rocks and crystals to be used for crafting items and upgrades. Crafting “recipes” must be found separately through exploration, quests and bartering with traders, however once unlocked, players can use elements to upgrade their gear, develop fuel cells, and recharge their Exosuit, Mining Tool and ship. 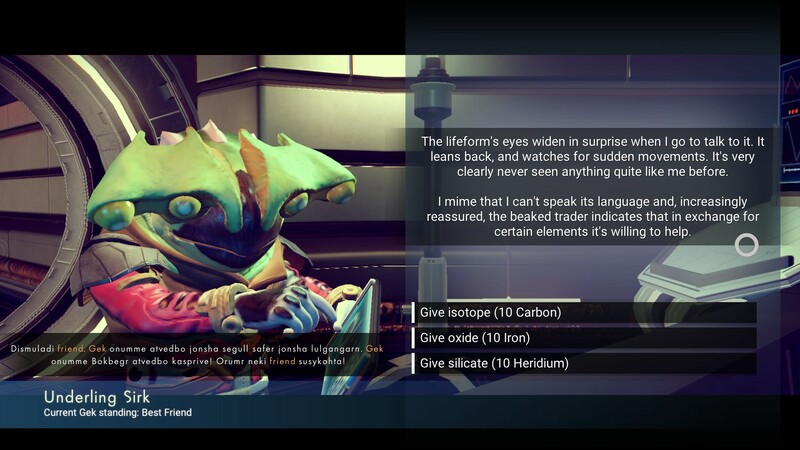 Elements can be used as a bartering tool for Traders, though the effectiveness is at the mercy of the player’s alien dictionary; often found within planetary Shelters and Space Stations, Traders will respond to The Traveler with an encrypted request for assistance. Depending on what the player offers in return, he or she may receive an item in return, except each offering yields a different response or gifted item; there are very few “wrong” responses to a Trader’s request, however the outcome may land the player with a new Mining Tool, when he or she could have ended up with a brand new ship. The proposed mega-structures from early gameplay trailers are nowhere to be seen among the procedurally-generated worlds of No Man’s Sky, but players can still visit the previously stated Monoliths and Ruins for an extra-terrestrial history lesson, or seek out Shelters in hopes of befriending Traders. Despite the title’s lack of a traditional map system, players can still find points of interest with the help of Beacons and Waypoints. Waypoints act as a dedicated game save location, with some possessing orange Beacon devices; once the player crafts a Bypass Chip, he or she can use the Beacon to locate a nearby Monolith, Ruin, Signal or Shelter to be marked on the radar system. Beacons are the simplest way to discover landmarks across each planet, however one Bypass Chip is required for each use. Though players may not have the option to “rest” at one, Shelters provide cover from potential storms and often contain an additional gameplay activity. Traders are usually found within Shelters, with the walls and main lobbies containing a Data Terminal, secondary Galactic Trade Terminal, or an upgrade or recipe for the Mining Tool and Exosuit. If players truly want to fast-track their way through suit and ship upgrades, they need to search not just for Shelters, but also “Distress Signals” from Beacons and Data Terminals, and planetary “Drop Pods”. Drop Pods are scattered across planets, with each one containing an Exosuit storage upgrade. Players can receive storage expansions through various Atlas Path tasks, however Drop Pods provide a much faster solution towards expanding The Traveler’s inventory system. A setback for those who do not frequent trading stations, the storage upgrade increases by 10,000 Units for every discovered Pod. Ship upgrades are a little more uncommon due to the randomness of Trader rewards. Fortunately Distress Signals are near guaranteed to grant players with an opportunity to receive another ship. Discovered through Beacons, a Distress Signal will direct The Traveler to a crash site holding a damaged ship and a terminal. Players are given the option of looting the ship or the pilot, but for those who are willing to put forth the effort, the downed ship can be taken for themselves; once the ship’s internal abilities have been repaired, players can then transfer their items and continue playing with a brand new ship. The wildlife isn’t the only hostile force of No Man’s Sky, as Sentry Drones patrol nearly every planet. Players are free to extract resources as they please, however they may attract the attention of the Sentries, designed to observe the natural state of each planet. If a Sentry Drone spots The Traveler mining or destroying resources, they will immediately converge and start attacking the player; if left unattended for too long, Sentries will call higher level patrol units to the area bent on the player’s death. Sentries will also attack players who attempt to break into locked Shelters. What may be a design oversight due to their line-of-sight mechanics, players can simply walk into a previously secured Shelter to break the Sentries’ line of sight, forcing them to call off their attack. 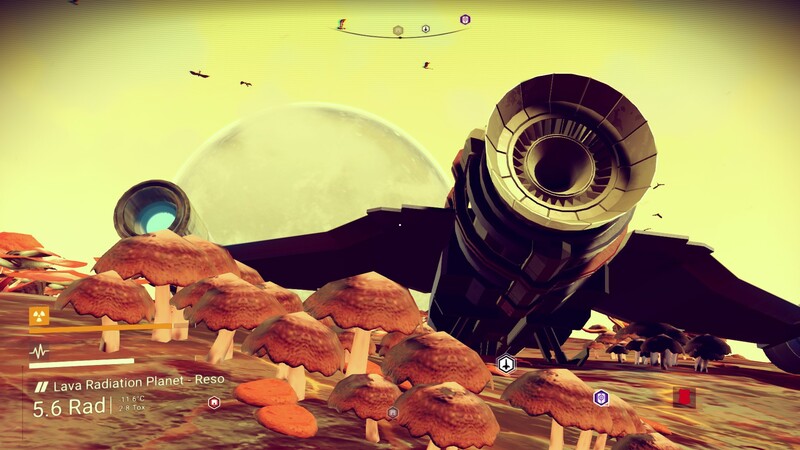 The penultimate gameplay draw of No Man’s Sky, players are free to explore open space as they see fit. The Traveler can fly between planets in real-time, or use the Pulse Drive booster to speed things up to a manageable pace; an hour’s flight can be reduced to minutes, assuming the ship has a charged Pulse Drive. The main engine and Pulse Drive can be replenished by shooting asteroids containing “Thamium9”, “Plutonium” and other resources. The majority of planetary systems contain a Space Station usually suspended in the center of the compact solar system. These act as an off-planet save station for players to sell and purchase items, and potentially gain new ships; once the “Atlas Pass” is constructed, The Traveler can access additional rooms filled with resources. Players will periodically fly across massive freighter ships floating about in the emptiness of space. The Traveler can’t actually gain one of these super-vessels, however he or she can aide them in combat against enemy ships, or attack the freighters themselves- the latter is not recommended. After constructing a Hyperdrive, players can access the Galactic Map, highlighting every star system within the game. Depending on the level of the Hyperdrive, The Traveler can directly warp to a new solar system; for those who care about the Altas Path, the Galactic Map also indicates which systems to visit on the journey towards the center of the universe. To say there’s nothing to do in No Man’s Sky is a clear understatement, however the game lacks strong direction. Outside of the loose story provided by the Altas Path, there’s no understood reason or goal that drives the gameplay, which may drain the player’s own willingness to continue playing. The apparent lack of active multiplayer makes for a rather lonely single-player experience, which may lead to outright boredom. 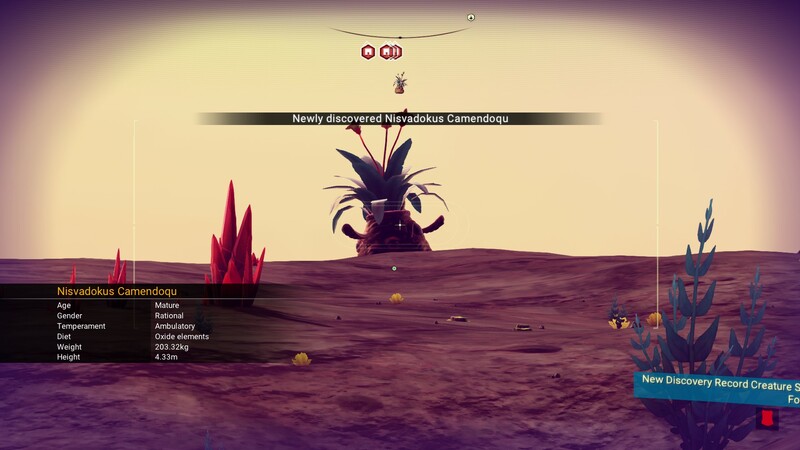 Players have reportedly discovered each others’ planets while actively playing, but even if multiple players wind up in the exact same spot, they will never engage with each other; the only multiplayer aspect lies within the discovery system. No Man’s Sky may not have had a flawless launch, though Hello Games is currently patching the PC version to be on-par with its PS4 counterpart. There’s still light-years of improvements to be made before the consumer version reaches the visual fidelity of the trailers, but that’s not to say No Man’s Sky isn’t a beautiful title. Each planet is full of vibrant colors and a wide array of natural landmasses to explore. Due to the game’s procedural engine, players are bound to find plenty of varied places to explore, from purely aquatic planets, to scorched volcanic moons, and some planets that just may as well be another Earth. A glaring setback for those who explore every mountain and chasm, there’s no environmental variations on the surface- no biomes and ecosystems; if a player runs into a barren desert planet, the entire surface will be nothing but endless sands. While this does promote interplanetary travel, surface-level exploration tends to drag after a few hours of staring at the same environment. Portions of the UI have been changed from translucent labels to black boxes around the screen; the discovery HUD is no longer tracks the researched object in the environment- it’s now a stationary black box displaying statistics of the discovered item. Strangely, the option-select feature was not changed to suit the PC version; whether it’s a mouse-and-keyboard or a controller, players must select a menu option and hold the mouse or button until the circle icon fills. This becomes less of an inconvenience as players get accustomed to the game, but it still restricts the pace of inventory management and menu navigation. Though it tends to dwell in ambiance, band 65daysofstatic lends its unique talents to the soundtrack of No Man’s Sky. Much like the aliens and ship aesthetics of the game, the music emits a Hollywood film sci-fi aura, reminiscent of ‘Moon’, ‘2001: A Space Odyssey’ and ‘Interstellar’. The gameplay may fail to do so, but the music always keeps the player engaged, especially during skirmishes with space pirates and sentries. 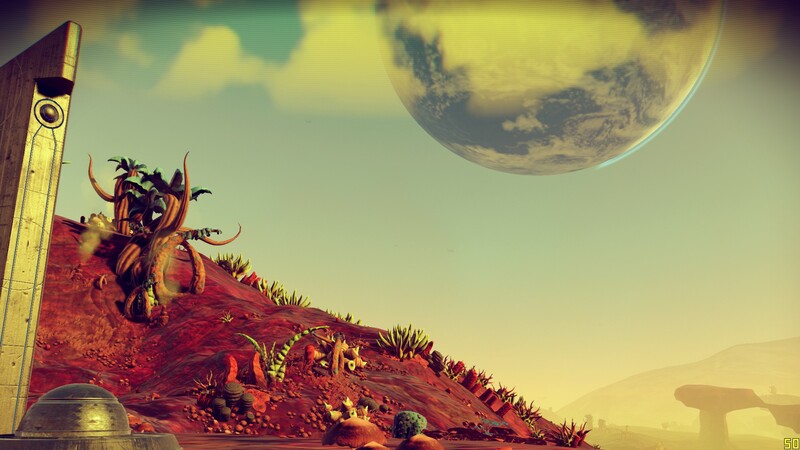 No Man’s Sky title offers players an entire universe to explore without boundaries, however the novelty of absolute freedom conversely runs dry in the absence of direction. There’s pleasure to be found in the idea that players are individually documenting the universe, claiming new discoveries for themselves, but the lack of player-to-player interaction makes for a lonely, if not boring adventure. No Man’s Sky is an ambitious project, but without a centralized direction outside “explore the universe”, it simply fails to captivate for extended periods of time.